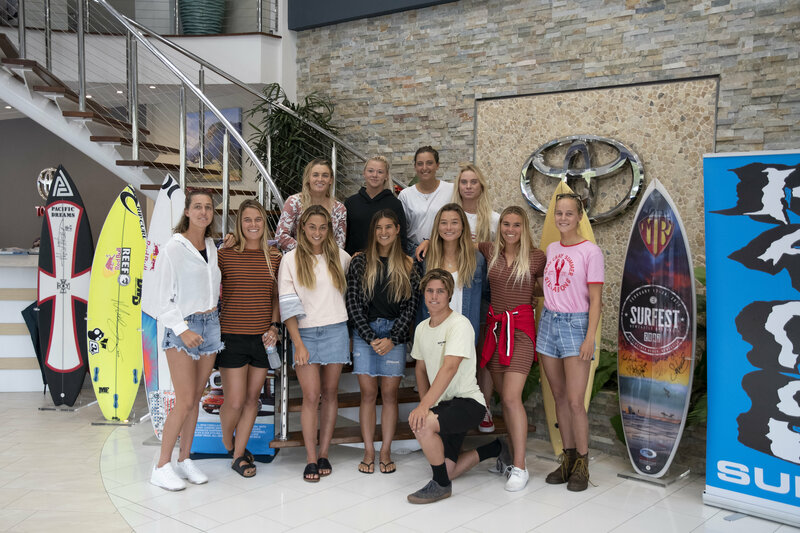 Birubi Beach, Port Stephens NSW/AUS (Wednesday, November 7, 2018) – A host of the world’s top female surfers have landed in New South Wales ahead of the 2018 Port Stephens Toyota Pro. The World Surf League (WSL) Qualifying Series 6000 event is the last stop on the Women’s QS for the year and brings with it huge ramifications for competitors vying for a spot on the elite Championship Tour for 2019. Fresh of a runner-up finish as a wildcard in the recent Roxy Pro France, Macy Callaghan (AUS) is coming into the Port Stephens Toyota Pro with a solid opportunity at becoming a full-time competitor on the Women’s CT in 2019. Having missed out on qualification by one heat at this event last year, the former World Junior Champion is taking a more relaxed approach coming into the final event of the season. Another young-gun sitting on the cusp of qualification is Costa Rica’s Brisa Hennessey (CRI) who finds herself in 10th place on the rankings. The 19-year-old Oahu, Hawaii resident is keeping a lid on her expectations but is more than aware that this is the most important event of her young career. Perennial qualification threat Philippa Anderson (AUS) is excited to be finishing off the season in her backyard, as the Newcastle local looks to breakthrough and book herself a spot on the ‘Dream Tour.’ Anderson will need a lot to go her way this week but is positive that she is in the right mindset to deal with whatever comes her way. A throng of current CT competitors, including Sage Erickson (USA), Paige Hareb (NZL), Malia Manuel (HAW), Nikki Van Dijk (AUS) and Bronte Macaulay (AUS) to name a few will attempt to cement their spot on the 2019 CT through a decent result at the Port Stephens Toyota Pro. A finals appearance or win would ensure all surfers are in the box-seat to stay on tour for next year. The Port Stephens Toyota Pro will also play host to a Men’s QS1,000 which will crown the WSL Australia / Oceania regional Qualifying Series Champion for 2018. Taking the top spot will gift the winner a seeding into all of the QS6,000 and 10,000 events for the opening half of the 2019 Season. Sitting within striking distance of this feat is Newcastle local Morgan Cibilic (AUS) who is hoping to lean on his intimate knowledge of the area to post one more solid result for the season. The 2018 Port Stephens Toyota Pro will run from November 8 – 13. The event will be broadcast live from the 10th – 13th at www.worldsurfleague.com and on the free WSL App. Head here for more information, results, images and highlights. The 2018 Port Stephens Toyota Pro couldn’t happen without the support of the NSW Government via its tourism and major events agency, Destination NSW. The event is also supported by Port Stephens Toyota, Port Stephens Council, AirAsia, Kaos Surf, PRD Nationwide, Wanderers Retreat, The Oasis Eco Retreat, Murrays Brewery, Surfing NSW and WSL. Next → Next post: FIS Freeski World Cup Stubai 2018: Elite Riders Confirmed!